Back in 1988, we saw that big businesses could get custom bags by ordering in big volume, but what about small businesses? None of the packaging companies wanted to bother with them. That seemed unfair to us. Being a small business ourselves, we knew that small businesses needed the advertising exposure the most. So the Bag Ladies decided to offer small quantities of printed bags (1,000 or less) to the small business owner who did not have the space or budget to order from the large manufacturers. We bought our own printing machines and learned from scratch every aspect of the bag business. We learned the old-fashioned way: we did it all ourselves. We took the orders. We printed the bags. We were proud to offer printed bags to businesses that could not afford to order thousands of bags. We’ve watched our customers grow and prosper throughout the years. With custom-printed bags, you can increase the size of your orders, the frequency of your orders and create great word-of-mouth. We found a way to deliver high-quality custom bags with fast lead time. We did the rush orders that other companies couldn’t do. We’ve never missed a deadline. Since we’re known for trade show and special event bags, we know how to work with your schedule. With our on-time guarantee, if you’re bags are not delivered on time, they’re free. Linda Hollander, one of the Bag Ladies, wrote the # 1 best-selling book, Bags to Riches. Known as the “Wealthy Bag Lady”, she is a marketing expert and popular speaker who helps companies grow their businesses. Fast forward to today. Packaging companies have learned what The Bag Ladies knew all along: the importance of your small business. Some other packaging companies are just order-takers who haven’t been in the trenches. They don’t have the knowledge of the packaging business inside and out. To them, customers are just numbers on a computer screen. 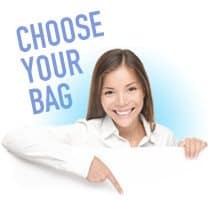 The Bag Ladies have always offered personalized service that other companies can’t duplicate. We’ve had over two decades of experience that is simply hard to match. We can’t get more “experienced” than that.